There is a strange issue in SharePoint 2013 environment today! One of the site collection provisioned via custom code is unreachable with "404 page not found" error. However, the particular site is listed under central administration >> View all Site collections! But no further details such as : Content database, etc. are available for the site collection in Central administration. We concluded that the site collection is "Corrupted!". There are many scenarios where a site may go corrupted, such as: Storage media failure, Network connectivity issues, incorrect usage of PowerShell cmdlets (E.g. If you use Copy-SPSite without "DestinationDatabase" parameter, You'll end-up in corrupted site! ), etc. So, We tried deleting the site collection from SharePoint central admin, but SharePoint central administration didn't let me to select and delete the site. Tried STSADM -o DeleteSite and Remove-SPSite PowerShell cmdlet with no luck! Solution: How to Delete Corrupted Site Collections in SharePoint? We can delete corrupt site collections with either STSADM or with PowerShell in below methods. 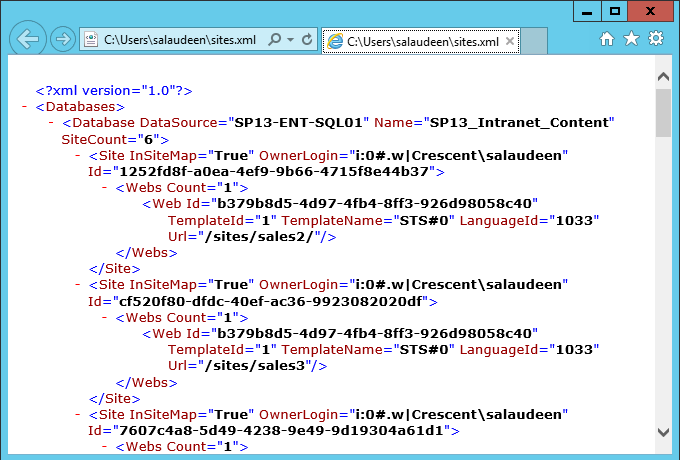 This produces a XML file with details such as site collection ids, content database, database server, etc as below. Use this PowerShell script to delete a corrupted site collection in SharePoint.